Proceedings LDIC 2018 is now available. 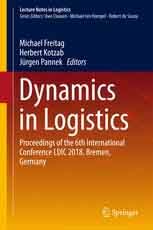 The International Conference on Dynamics in Logistics (LDIC) is a biennial conference organized by the Bremen Research Cluster for Dynamics in Logistics. The conference addresses scientists in logistics, operations research, production engineering, and computer science and aims at bringing together researchers and practitioners interested in dynamics in logistics. The LDIC provides a platform for discussion of advances in the areas of dynamical aspects of logistic processes and networks. The spectrum of topics reaches from modeling, planning and control of processes over supply chain management and maritime logistics to innovative technologies and robotic applications for cyber-physical production and logistic systems. The growing dynamic confronts the area of logistics with completely new challenges: it must become possible to describe, identify and analyze the process changes. Moreover, logistic processes and networks must be redevised to be rapidly and flexibly adaptable to continuously changing conditions.